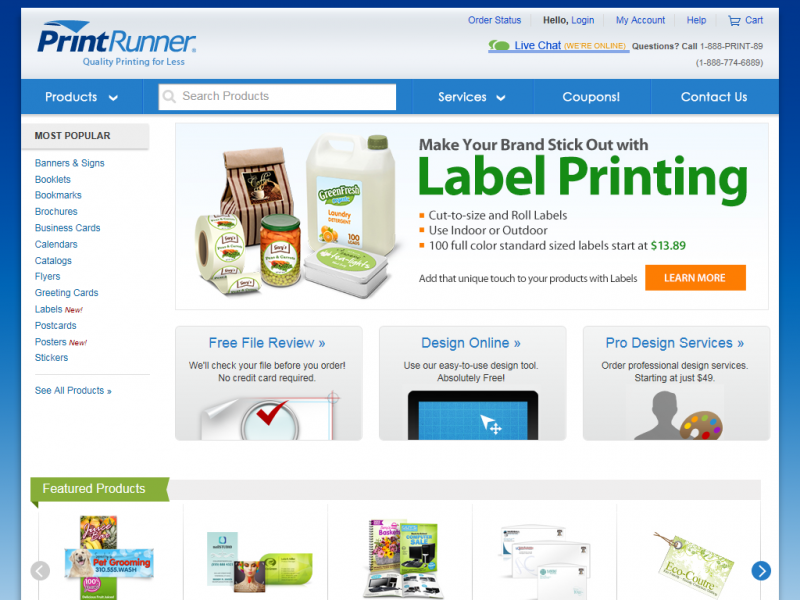 PrintRunner’s tagline is “quality printing for less”—and that tagline holds true. This printing service offers a variety of low-cost printing options, from business cards to full-color brochures to postcards, and so much more. Operating for ten years, PrintRunner does all of their business in-house, so they can ensure high quality printing. And it’s the little details that make them stand out: they offer coupons on their site, the website is very easy to navigate, and they have a 100% satisfaction guarantee. They even have an interesting blog with useful marketing tips! Setting up a print order is easy. You can upload your own files or use their online design tool or templates. There are plenty of options, including quantity, type of paper, ink, finishing and binding. Not only does this company have affordable and quality services; they also make it easy to ask questions and speak with their team. It’s easy to get in contact with exactly the department you need—whether it’s shipping, billing, or graphic design—because toll-free phone numbers, email addresses, and business hours are listed prominently on the site. The site also features a live chat option—so if you have questions as you’re placing an order, you can chat with someone immediately. PrintRunner offers an incredibly wide variety of printing services…from the basics like business cards, brochures and letterhead, to more unique services like vinyl banners, magnets and embossing. When filling out the online print order, you can choose basics like size, quantity, paper quality, and colors. Each product may have additional order options (such as folding, coating or numbering, for example). After filling out these options, you can also instantly see the turnaround time, so you know when you can expect to receive your order. Every order comes with the option of having a proof sent to you. There are many templates available on the site if you don’t have your own file to upload. As a bonus, the Help section answers a lot of common questions about how to get your order just right. Sometimes the products listed are not exactly what you need for your print project, so PrintRunner offers custom projects. To get more information, you can fill out their online form, call the toll free phone number, or use their live chat feature to get a quote and ask further questions. In addition to printing services, PrintRunner also offers direct mail and design services. The direct mail service allows you to have your project printed—say, for example, a post card—and then sent from PrintRunner directly to customers. You can either provide your own mailing list, or they can help you choose a targeted mailing list. Costs are based on postage, size of pieces of mail and mailing list. PrintRunner provides CASS Certified mailings. The design services allow you to have PrintRunner create custom design for any type of print product—taking the hassle of designing a nice product out of your hands. Printing costs are in addition to design services. 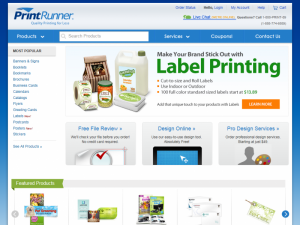 PrintRunner is a popular, easy-to-use and great quality printing service. 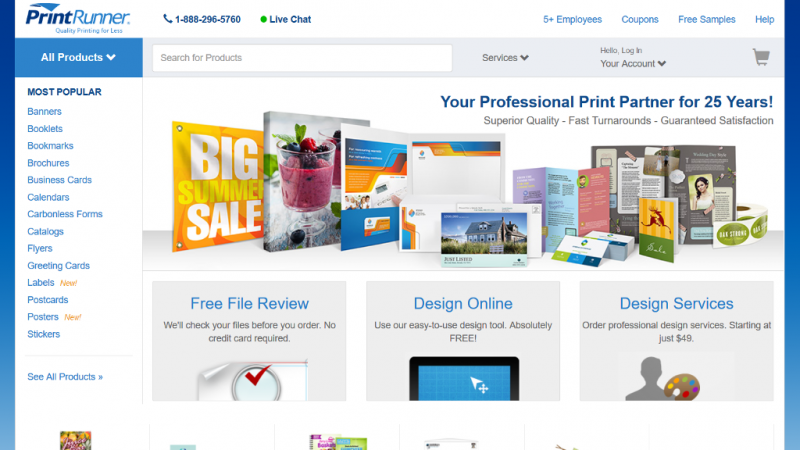 The site is very user-friend, offering plenty of templates and “how-tos” to get your printing job just right. It’s easy to chat online with a customer service representative, which is very useful if you have questions or concerns about your print job. Overall, this is a reasonably-priced printer that offers high quality printing and decent turn-around time.